"It's not just a workshop, it's a full bodied art experience!" Course descriptions will be available approx. 6 weeks. in advance. "Doing this kind of art made me realize that I don’t have to be perfect. The ink does it for you. I am so looking forward to our next class, and I expect to attend many more. The group is very sweet and friendly. That is such a breath of fresh air when you get a new group of people together and you immediately like them." ~ Carla S.
Sign Me Up for the Preferred Workshop and ECourse List. Get early notice of course and workshop openings in your inbox. No need for plans, sketches or prior art experience of any kind! Employ pouring, painting and stamping techniques while using all the tools that will instantly get you creating your own captivating, vibrant Alcohol Ink paintings. All supplies needed are included in the *$45.00 starter kit. Ceramic tiles, display easels, Yupo paper and mats are included in the workshop fee, so you'll leave with your own ready to display art pieces. To register, use the BUY NOW button for the workshop you want to attend. If you prefer to pay by check or cash call Sandy at 609-268-9106 to make arrangements and reserve your spot. If the workshop is cancelled, 100% of fees will be returned. For participant cancellations, the enrollment fee will be credited towards future classes. You can buy the kit or purchase and bring your own materials - *see the material list and kit here. 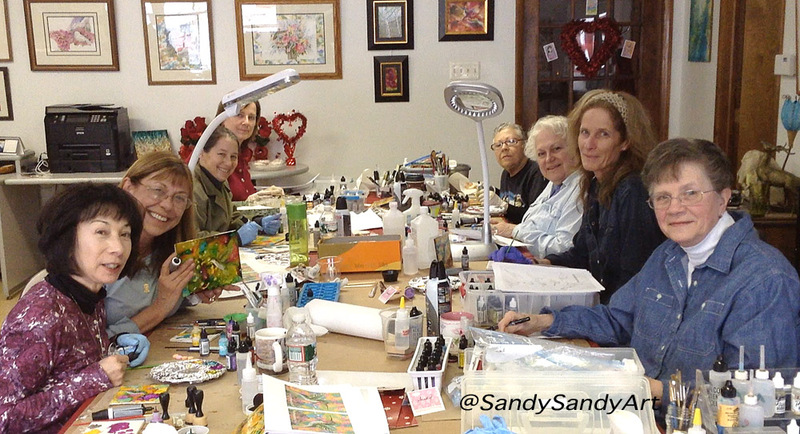 More details and photos from Sandy's workshops here.